Now and then we get into one of those dreadful artistic ruts that leave us rudderless for periods, not quite knowing which direction to take, and finding little inspiration in anything. One great way of snapping out of these doldrums is to try a different medium, perhaps only slightly different, but enough to spur you on to greener pastures. Derwent are always bringing out exciting new ideas, and many of them are related to watercolour, which has the advantage of taking us into new areas of working, but ones which can also give our watercolours a new lift. I’ve just been trying out the new Derwent XL Graphite blocks – a set of six chunky watersoluble blocks, and as you can see in the picture on the left, you would be hard pressed to tell the difference between these and watercolour. I began by laying olive green across the foliage areas, blending it in with a finger and then washing over it with a number 10 round brush with clean water. 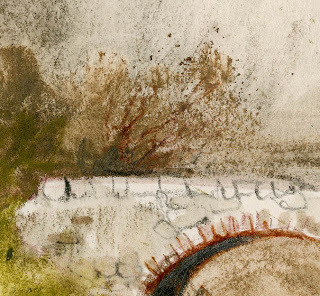 I had already laid more olive green on a piece of scrap paper and picked up a quite strong mix of this with a fine number 2 brush, drawing the tree trunks and branches into the wet wash, wet-in-wet style. Quickly I then applied more olive green strongly into the upper parts and directly with the block. Going on to a wet surface it produced a deeper tone which I then worked into with a brush to suggest the loose leaves and some of the ground cover. The paper was still wet enough for me to work in a soft grey colour with the number 10 brush to suggest the more distant rocks. I then drew burnt umber in with the block for the darker rocks, softening it off in places with a brush before completing the work with blue over the foreground. including a touch of green reflections here and there. Derwent have also come up with a really useful sprinkler tool – a small grid across which you rasp the XL Graphite block to create a spatter effect. I did this on a different composition, and the technique works deliciously when dropped onto a wet surface as here where I’m suggesting a bush. The branches were created with a fine rigger, picking up colour directly off the burnt umber block. These blocks can be used for many purposes, apart from creating paintings by themselves. They can be combined with normal watercolour, can be used to rescue a wayward watercolour, and are great for doing quick studio sketches in planning out a larger painting. Give them a try, they really are tremendous fun, and if you wish can be readily combined with the Graphitint pencils. The only problem I have now is that Jenny has just seen my work and has run off with my XL blocks…….. 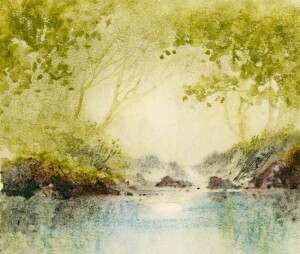 This entry was posted in David Bellamy, watercolour sketch and tagged Derwent XL Graphite Blocks, Drawing, sketching, Watercolour techniques by David Bellamy. Bookmark the permalink.